Dr. Prem Jain is a distinguished and proud alumnus of the College of Science and Engineering where he earned both a master of science and doctorate in mechanical engineering while maintaining a perfect grade-point average. This academic achievement foreshadowed his highly successful, lengthy, and honored career that has followed. Considered by many as the “father of air-conditioning” in India, he is among the world's preeminent engineers. Dr. Jain’s notable career started with an invitation to work in the legendary Dr. Willis Carrier’s Research and Development Group. While there, he worked on projects for NASA and witnessed the birth of intelligent buildings and building automation systems. He returned to India in 1970 as a visiting professor at the Indian Institute of Technology to set up a laboratory for environmental engineering. A decade later, Dr. Jain founded Spectral Services—the largest privately held consulting engineering company in India. His company started with a staff of four and has grown to more than 500 employees with nine offices in India and one abroad. Under his leadership, Spectral Services has become a leader in the field of green engineering including being distinguished as the only consultancy in India to design the service systems for five green buildings with LEED Platinum certification. 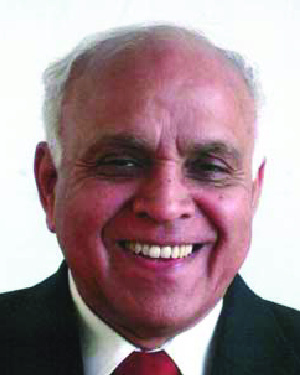 He also founded the Indian Society of Heating, Refrigerating, and Air Conditioning Engineering (ISHRAE) in 1980. ISHRAE has grown into a thriving organization with more than 6,500 members, 25 chapters, and 50 student chapters across India. Dr. Jain is a leader in corporate responsibility. He is the chairman of the Indian Green Building Council for preservation of the environment and mitigating global warming—the Indian counterpart of the U.S. Green Building Council. The vision of the council is to usher in a green building revolution and to facilitate India emerging as a global leader in green building design. Dr. Jain became a key figure in improving energy efficiency in India when his expertise was sought to rewrite the air conditioning, heating, and ventilation section of India’s national building code. Dr. Jain’s impact has been far-reaching and well noted. He has been a visiting faculty member at the School of Architecture, Delhi University for more than 35 years and has taught and mentored more than 5,000 architecture students. In 1990 Dr. Jain was awarded the Best Faculty award from Delhi University. ISHRAE has bestowed upon him its Lifetime Achievement Award and the unique distinction of president emeritus. The American Society of Heating, Refrigerating, and Air-Conditioning Engineers(ASHRAE) awarded him the John J. James International Award, and its highest award of Distinguished Fellow, the first practicing engineer in India to receive this honor. In naming Dr. Jain a recipient of the Distinguished Leadership Award for Internationals, the selection committee cited his dedication to the field of engineering and the contributions he has made to environmental sustainability in India and throughout the world.